A.O. Smith Z4 Water Purifier Review: In A.O. Smith Z4 RO Water Purifier, 100% of the water passes through the unique patented side stream RO membrane and is further purified by Silver Charged Membrane Technology (SCMT). The MIN-TECH (Mineraliser Technology) restores essential minerals to water, making your water healthy and tasty. A. O. Smith Corporation is an American manufacturer of both residential and commercial water heaters and boilers and it is the largest manufacturer of water heaters in North America. The company has 24 locations worldwide and have recently set their footprint in India with the launch of water purifiers and water heaters. I’ve got my hands on the A. O. Smith Z4 water purifier and here’s my review. Build: A.O. Smith Z4 is made with food grade, non-toxic, engineering grade plastics. Such plastic is considered nontoxic and BPA free, this keeps the water bacteria free even when stored for longer duration. The water purifier is flexible to be installed on a table top or wall mounted and it does not eat up the kitchen real estate, thanks to its W315 x D310 x H490 (mm) dimensions that make it look really neat & compact. The body corners are neat, elegant without any sharp corners or gaps between the side panels. The large 9 liter water tank is quite handy to store enough water for daily consumption. A. O. Smith Z4 is offered with ColorMatch System with four color options; electric blue, passion red, Yale blue and speldour lilac for you to choose from. Technology: A.O. Smith Z4 purifier is equipped with an advanced 7 stage water purification process that includes Pre-filter + Sediment filter + Pre Carbon filter + Side Stream RO + MIN-TECH (Mineralizer Technology) + Silver Activated Post Carbon and SCMT (Silver Charged Membrane Technology) filter. These powerful filters can remove TDS greater than 95% and help in water recovery up to 30% without slowing down the water flow rate at 15 liters per hour. Stage 1 – Pre-filter: The Pre-filter is used to remove physical contaminants such as dirt, dust, soil particles, turbidity present in the water. This improves the life of the Sediment filter. Stage 2 – Sediment filter: The Sediment filter is used to remove fine and coarse physical contaminants present in the water.This improves life of the Pre Carbon filter and ensures efficient working of RO membrane. Stage 3 – Pre carbon filter: The Pre Carbon filter uses carbon block with high adsorbtion capacity which reduces harmful chemicals including pesticides, volatile organic compounds, residual chlorine etc., from water. It also adsorbs bad taste and odour causing organic compounds from water. Stage 4 – RO (Reverse Osmosis) membrane: RO membrane contains semi-permeable membrane wherein the water is passed through the semi-permeable membrane to remove TDS (Total Dissolved Solids) and heavy metals like mercury, arsenic, lead, chromium, cadmium etc. It also removes microorganisms like bacteria, virus, protozoa and cysts. Stage 5 – MIN TECH (Mineralizer Technology):The MIN-TECH contains Calcium and Magnesium minerals which helps to improve the taste and quality of water. It adds the required essential minerals back to water and balances the pH of water. Stage 6 – Silver Activated Post Carbon: Water is passed through Silver Activated Post Carbon which acts as polisher and enhances the taste of water. Stage 7 – SCMT filter (Silver Charged Membrane Technology): In the final stage, water is passed through SCMT filter which ensures double purification of water making it pure & sure for drinking. A.O. Smith Z4 water purifier is equipped with all the bells & whistles, filter change indicators and an auto flushing mechanism that cleans the RO membrane, it also enhances the life of RO membrane. The mineralizer technology restores essential minerals and adjusts the ph value of water for a better taste. This is a great option as the RO filtered water doesn’t really taste good. Design: A.O. 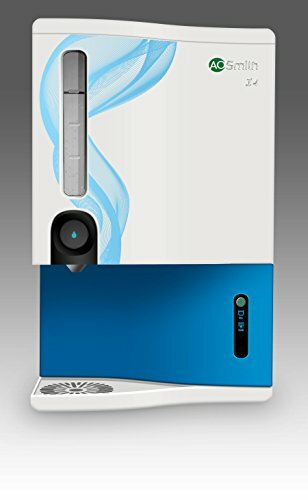 Smith Z4 Water Purifier is a well designed, intuitive, sleek and feature packed water purifier that can blend with any modular kitchen that you have with its multiple color options to choose from. The LED display panel indicator strip is neat, clutter free and easy to read with just 5 indicators that are programmed to display power, tank full, auto flushing, RO and SCPA lights. One touch water dispensing option is a slick feature, but, it doesn’t work without the water purifier being powered on. Service & Price: A.O Smith is headquartered in Bengaluru, Karnataka and has regional presence in Mumbai and Delhi. A. O. Smith water purifiers are sold and serviced in major cities of India and the company plans to expand its presence to other cities very soon. The pre-filters and sediment pre-carbon filters have an average lifespan of 2500 liters, MIN-TECH will last up to 6000 liters of water and the expensive RO membrane can purify between 6000 to 12000 liters of water depending on the input quality. The water purifier is delivered with a comprehensive 12 month warranty and the RO membrane with 24 month warranty. A.O. Smith Z4 water purifier is retailing at ₹ 21,950.00 and is available online at Amazon.in from ₹ 19,950.00, customers are eligible for the same 2 year warranty and free installation when purchased online at Amazon.in. Conclusion: A.O. Smith Z4 is a well built, feature packed RO water purifier with 7 stage purification technology.The ColorMatch System gives you an option to choose from 4 colors that best suits your modern kitchen. A. O. Smith have equipped Z4 water purifier with unique technology and features to make their devices stand out in competition, one touch water dispensing, mineralizer-technology, excellent TDS reduction of over 95% and best in class warranty are a few pointers that will make you consider buying the A.O. Smith Z4 water purifier. A.O. Smith Z4 water purifier is retailing at ₹ 21,950.00 and is available online at Amazon.in from ₹ 19,950.00, customers are eligible for the same 2 year warranty and free installation when purchased online at Amazon.in.